Nov. 11, 2017 1:30 p.m.
Prime Minister Justin Trudeau says it shouldn’t have come as a surprise to anyone when Canada declined to sign an agreement-in-principle Friday on an updated Trans-Pacific Partnership trade deal. Trudeau said Saturday in Vietnam that despite some significant progress on the deal’s framework there’s still more work to be done, particularly when it comes to protecting Canada’s auto and cultural sectors. His decision Friday to keep negotiating for a better deal in the 11-country pact rather than striking an agreement led to the abrupt cancellation of a TPP leaders’ meeting on the sidelines of a summit of the Asia-Pacific Economic Co-operation. The move prompted international headlines because foreign media reports had predicted TPP partners would reach an agreement when they gathered for the APEC event in Danang. But Trudeau argued he sent signals all week that Canada would not close the TPP treaty unless it was right for Canadians. 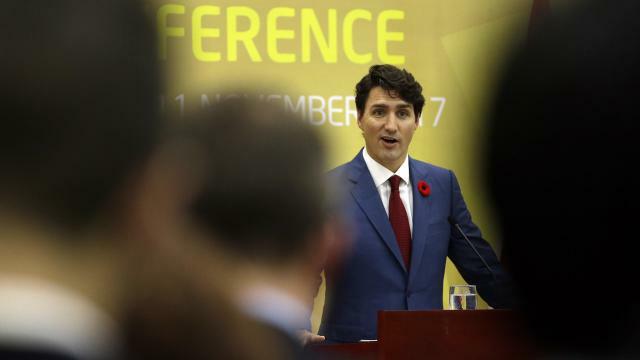 “We were not going to be rushed into a deal,” Trudeau told reporters at his closing APEC news conference before heading to Philippines for a Sunday summit of southeast Asian leaders. Trudeau credited improvements made by TPP trade ministers at the summit for agreeing to several changes that moved the talks closer to an agreement. “We obviously had lots to talk about and at the end of that meeting it became clear that it was in everyone’s interest to postpone the leaders’ meeting on the TPP11,” Trudeau said. After their 50-minute meeting, Trudeau said Abe, co-chair of the TPP leaders’ group, went to tell the other leaders, who had already gathered in the room, that the meeting had been postponed. The cancellation set off a confusing day of talks. Media reports directly blamed Canada and Trudeau for helping to scuttle the scheduled meeting. The remaining TPP countries have been working to salvage the deal, which was abandoned earlier this year by U.S. President Donald Trump. A report in Australia’s Sydney Morning Herald said Trudeau “sabotaged” the talks at the last minute by failing to show up for the meeting. The New Zealand Herald said Trudeau’s “no-show” had delayed TPP talks indefinitely. Late Friday, International Trade Minister Francois-Philippe Champagne announced progress had been made. TPP trade ministers had agreed to a number of key changes to nudge negotiations closer to a deal and he said Canada would be better off because of them. The TPP countries agreed Friday to suspend controversial provisions from the original TPP deal related to intellectual property. The Canadian tech-sector has long urged Ottawa to fight for the removal of those elements from the deal. Champagne said the TPP partners also established a framework to deal with rules of origin issues related to the auto sector and on how the countries will proceed with including cultural exemptions into the treaty. The parties also agreed, he added, to enhance elements in the pact related to the environment and are much closer to stronger protections of labour rights. Trudeau predicted Saturday that the TPP talks would help Canada in its tough renegotiation of the North American Free Trade Agreement. “The reality is that showing we are in the process of diversifying our economic interests helps us in the NAFTA negotiations,” he said. On Sunday, Trudeau will attend the ASEAN summit of 10 Southeast Asian leaders in Manila, hosted by President Rodgrigo Duterte, who has faced harsh international criticism for his human rights record. Canada has been a “dialogue partner” of the peace and security group for 40 years, but Trudeau said he has no plans for have a formal bilateral meeting with the Filipino leader. “This is an opportunity, obviously, to meet with many leaders and President Duterte is going to be hosting. There are a range of issues that I could bring up with him, that I may bring up with him, if we have an opportunity. There is no formal meeting with him,” Trudeau told reporters on Saturday.